In large bowl, mix chicken, dressing mix, hot sauce, cream cheese spread and yogurt. Set aside. Unroll dough into large rectangle. Cut dough into 12 equal squares. Place 1 dough square in each muffin cup. Press dough in bottoms and up sides of cups. Divide chicken mixture evenly into cups, using about 1 tablespoon in each. 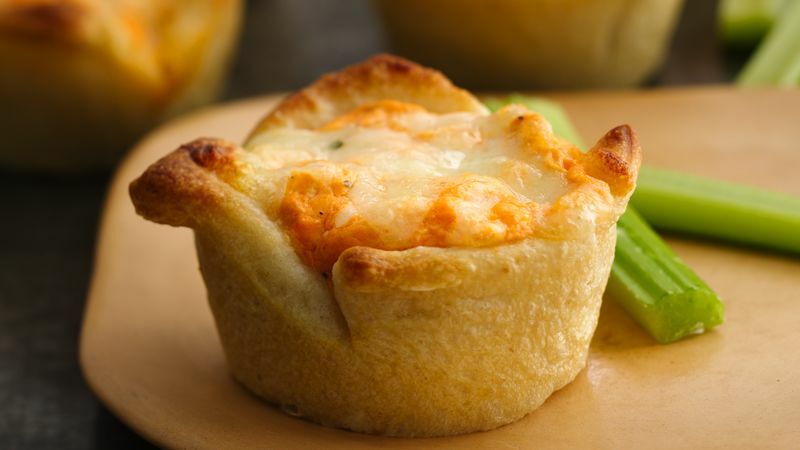 Sprinkle cheese evenly on top of filling in each cup. Bake about 15 minutes or until crusts are golden brown and filling is hot. Serve immediately. Depending on how hot you like buffalo chicken flavors, you can cut back or add more of the hot sauce. This is a great recipe to use leftover deli rotisserie chicken!